Sony launched a website honoring the best in-store Uncharted 3 displays across the country. The number one entry, a Futaba Tosho branch, featured a life-sized Sully breaking through the ceiling and holding a life-sized Nathan Drake. The other entries were good, but nothing as mind-bogglingly wonderful as the first place display. You can see the first, the second, and the third place selections in the link below as well as all the Uncharted 3 displays across Japan. 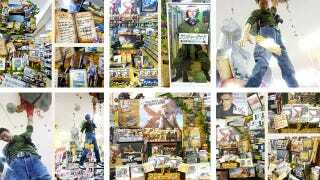 In-store displays in Japan often get creative; however, the wildest ones tend to be for adult Japan-only PC games.